When you live in a rural or suburban home that can’t be connected to the municipal sewer system, installing a septic tank seems like the obvious choice. For as practical as septic systems are, though, they don’t work in every situation. In locations where the soil is too shallow or dense, the water table is too high or another issue prevents you from installing a septic tank, there are alternatives that will meet local regulations and keep the surrounding environment clean. This system uses a standard septic tank, but instead of the conventional pipe leach field, the leach field is made of interlocking polyethylene arches that provide a continuous drainage area. The chambers create an empty space for effluent to flow through, so there’s no need for gravel or geotextile. If you prefer, though, these materials can be added to improve the system’s longevity. These systems are quick and easy to install, and the job requires minimal equipment. Because they take up less space than systems with conventional leach fields, they’re ideal for small building sites and installation will cause minimal disruption to the existing landscape. They also typically last longer than conventional systems. Mound and raised bed septic systems are similar to conventional systems, except that the soil is specially prepared to create an area where the effluent is treated. The sand-lined filter bed is one of the most popular choices. In this system, small distribution pipes are set into a layer of gravel that sits over a layer of sand. The whole area is covered completely with top soil to form a mound. Additionally, the system includes a dosing chamber that collects the wastewater that leaves the septic tank. This chamber releases effluent at a controlled rate to prevent overloading of the leach field. In most systems, an alarm sounds if the pump malfunctions and puts the leach field at risk. An observation tube is installed to allow for inspection of the tank without the need to reach the access port under the soil. Monitoring wells are installed so leach field conditions can be checked on easily. These systems use material such as sand, peat or synthetic textiles to filter effluent before it’s released into the leach field. Not only can these be installed where convention systems cannot be, they’re also less expensive in locations where gravel isn’t readily available. The sand filter is one of the most common of these. A sand filter consists of a box lined with concrete or PVC and filled with sand. This box is usually set into the ground, but can be installed above ground where necessary. Typically, the effluent is released from a dosing chamber onto the filter, then collected at the bottom of the filter and pumped to the leach field. Some systems recirculate the effluent through the filter several times before releasing it to the leach field. Geotextiles are another option for filtering effluent. Squares of specialized geotextile are laid horizontally or hung vertically in a container. The septic system recirculates effluent through the textile before pumping it out to the leach field. Geotextiles can retain more water than sand or peat, so systems that use this material require less space to treat an equal amount of effluent. This makes a geotextile system a good choice if you’re short on space. Less commonly used, but just as effective are open-celled polyurethane foam cubes. These cubes are packed into a container and sold as packaged media filter systems. In climates where hard freezes aren’t common, the packages can be placed above ground. Spray nozzles dose the effluent onto the top of the filter. This makes the system easy to maintain because the top section of the foam cubes can simply be removed and replaced when it becomes clogged. Like all septic systems, media filtration systems require regular maintenance, although the exact maintenance requirements vary depending on the media used. All system types require inspections in which the media bed is checked for signs that it’s due for cleaning or replacement. Even with regular cleaning, media filtration systems eventually become clogged and have to be replaced. A drip distribution, or drip disposal, septic system is similar in structure to a conventional septic system, but it includes an aerobic pre-treatment chamber and filtering device to further treat the wastewater. The treated water is then sent to an array of drip irrigation tubes to distribute the water over a large area. This water is clean enough to use for irrigating a lawn or non-edible plants. Plants remove excess nitrogen from the water, further purifying it. Because the drip distribution pipes are installed close to the soil surface, this system works well in shallow or compact soils and on steep inclines. In cold climates, however, freezing is a risk. 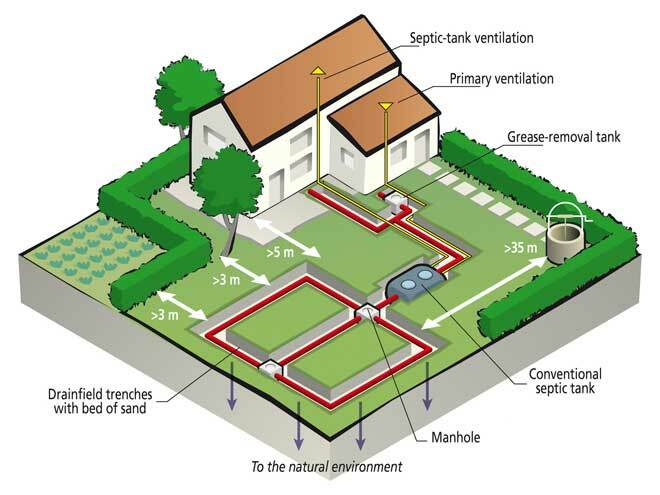 Aerobic septic systems, or ATUs, are essentially small, residential wastewater treatment facilities. They add oxygen to the septic system to encourage the growth of aerobic bacteria that break down the organic waste in the sewage. This results in a cleaner effluent. The system’s aeration chamber introduces oxygen into the sewage, allowing bacteria to multiply and break down the waste. Solids fall into a clarifier and are recirculated to the aeration chamber. The effluent, now free from organic waste and therefore odorless, rises into a chlorinator for disinfection. Once chlorinated, the now clean water moves to a holding chamber to be discharged later. ATUs provide a septic tank alternative for sites where a conventional drain field can’t be installed, making it possible to have wastewater treatment at sites with even the most difficult soil or topographical conditions. If your home is in an area where installing a conventional septic system is difficult or even impossible, you have several alternatives to choose from. If lack of space or shallow soil is your main concern, consider a plastic leach field chamber or a mound septic system. For sites where not even these alternatives will work, an aerobic sewage treatment system is still a viable option. Before you decide on an alternative septic system, however, talk with your local health department to find out what local and state regulations might apply to the system you have in mind.